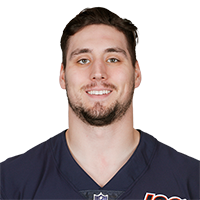 Published: Aug. 30, 2018 at 09:26 p.m.
Chicago Bears running back Ryan Nall turns the corner on the right side, and down the sideline for a 32-yard touchdown run. Published: Aug. 30, 2018 at 09:19 p.m.
Chicago Bears running back Ryan Nall plows through Bills defense for a 24-yard gain. Published: Aug. 9, 2018 at 09:37 p.m.
Chicago Bears running back Ryan Nall rushes for 69-yards.